Are You a Proper DJ? Mobile DJ Trade Tips - Issue 61 - Are You a Proper DJ? I bet that got your attention! There have been many discussions on social media sites recently about what makes a proper DJ with the ultimate conclusion that it's a DJ who mixes music to a high standard. In this Infomail we will explore the different types of DJs and the various markets that require a DJ, many of which don't require the DJ to be an expert at beat-mixing tracks. DJs are needed for many different occasions and celebrations; but is the skill set the same? Could a club DJ who gets 18 to 25 year olds going wild on the dance floor till 3am fair so well with a room full of 6 year olds or vice versa. Would a radio DJ know the protocol and pitfalls of DJing a wedding? The answer is generally no, as the skills needed for each environment differ greatly. It is possible to service all markets, as many DJs have proved. But if you were to specialise and hone your skills for one type of function, it is easier to become an expert in that field. Likewise, it is harder to market yourself as everything to everyone rather than aim your marketing material and website at one target market. This is a very special breed of DJ where the need to mix house music is very rarely needed. The ability to communicate at a child's level, have a commanding presence, engage them in fun activities and create mayhem while keeping control are more essential skills. Not everyone has the ability to maintain the sometimes fickle attention span of little people and a good children's DJ is in high demand as parents will be thinking of their own child's party when picking them up; so self perpetuating referrals are the key to succeeding in this market. Key skills: communicating with children, having a repertoire of fun activities, excellent mic work, confident presence on the dance floor. Within this category there are specialisations in particular genres of music. Mic work and a commanding presence are not key skills, but having creative mixing skills and an in-depth knowledge of your chosen genre are. Sensing the beat and understanding tempo and key changes coupled with familiarity of the music helps club DJs create those energising mixes that keep people dancing till the early hours. As a wedding specialist it is important to understand all the elements of a wedding and to be able to personalise the evening to make it special and memorable. Confident and clear mic work is essential in ensuring the event flows seamlessly between items such as introducing the first dance, the buffet and generally personalising the evening for the bride and groom. You need to be familiar with all the popular genres and know which songs work well together to keep guests on the dance floor and be able to entertain a wide range of ages. Communication and interaction is the key to a successful wedding DJ. This is a very broad area as it can range from 18ths to 70ths, 50th anniversaries to engagements. The key is being prepared for a wide range of ages and tastes. It’s hard to put the skills set of a party DJ into a neat box as they are so varied. One party could be wanting a nightclub feel whereas another might have a similar feel to a wedding. The main requirement for a party DJ is a very broad knowledge of different genres and decades of music. Creative mixing could be an advantage. 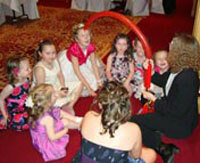 Corporate work is also very varied and includes black tie dinners and presentation evenings. Communication is key, not only with the organiser but also the delegates in attendance. The day or evening could involve presenting awards or organising the raffle, so clear and engaging mic work is a necessity. Product launches also fall into this category and can prove very lucrative. In answer to the original question of whether you are a proper DJ; we believe the answer is a resounding yes! A different skill set is needed for each type of DJ. By looking at the skill set for each type of DJ, we can make a better judgement as to whether to specialise and, if so, which area is best suited to us. It is often easier to be a master in one and, as a specialist, charge accordingly. If you are a proper DJ...take a look at the AMPdj book, DJ Hanks Really Useful Guide for Your Mobile Disco Business here http://www.ampdj.co.uk/store/ where the subject of specialising is discussed in more depth. 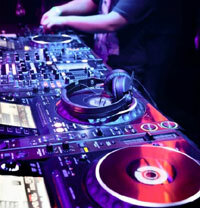 Know someone who might be interested in this Mobile DJ Trade Tips Infomail? Are you looking for ideas to make your show stand out from the crowd, ways to engage your audience, activities to create excitement and encourage more dancers? Visual DJ is an exciting new program which utilises an Xbox Kinect sensor (available from £25) to allow dancers to interact with the screen display or TV. "What we need is more people who specialise in the impossible." Who'd have thought that way back in 2009 when we launched these Mobile DJ Infomails, AMPdj would go on to support more DJs than any other organisation. We've also renamed these monthly newsletters to Mobile DJ Trade Tips as this reflects the content of them.